Markets are moving on the Blue Enzo, Black FXX and Tooned Enzo wave, but these are hardly see in sights due to its limited distribution. It is kind of eyes catching on this Black FXX on the black-red ring wheels. The Red-Ring has just enhanced the FXX on it furious look. 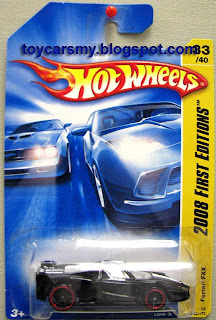 There could be an error car produced by the thousands of die cast made in the production line. Some collectors keep error cars due to its rareness. Over the years, Mattel has improved their QC process, where you hardly see error cars nowadays, furthermore it is a Ferrari FXX. 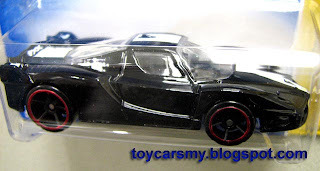 A Black FXX already worth RM20 today, what about this with Red-Ring wheels, RM50 or RM100?